The 3D printers, which originally were manufactured only for industrial use, step by step are becoming part of an everyday life. With their help it is possible to embody the most various ideas and to create unique things. 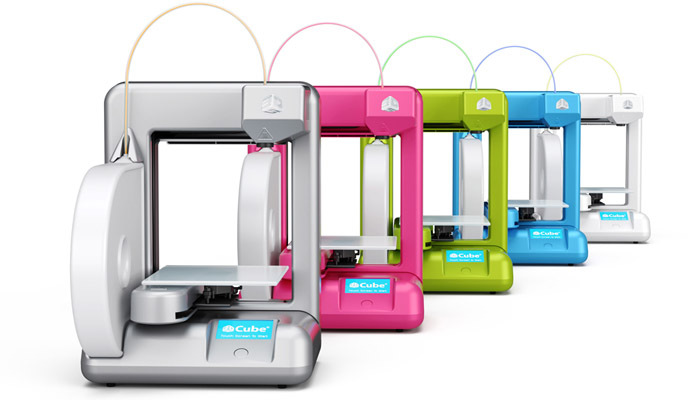 The Cube is the most compact and affordable model of a 3D desktop printer in a line of the “3D Systems”. The Cube has a user-friendly intuitive interface—it is the only printer in the world adapted for children (from 8 years old). This feature helped it to win the KAPi (Kids at Play Interactive) award 2013 in the USA. The printer is equipped with special overlays for an extruder, not disturbing the process of printing and protecting a child from an accidental touch to a hot extruder. Device dimensions (26 x 26 x 34 cm) and weight (4,3 kg without a cartridge) make the printer quite mobile. It can be easily moved from place to place, and it doesn’t occupy a lot of space. The printer connects to a computer via Wi-Fi, any additional wires are not required. Cubify Draw allows to draw any object on iPhone or iPad, the app will automatically turn it into a 3D model. Another app—Cubify Capture—turns the camera or the smartphone into a 3D scanner: a photo of an object can be sent to a special site and turned into a 3D model. The printable area (14 x 14 x 14 cm) allows to create toys for children, interior jewelry, accessories, including smartphone carring cases and many other things. What’s in the box? One cartridge and 25 3D files with the models developed by professional designers. The printer software allows to edit the preset models and to create new ones. The palette has 16 colors, 2 of which are fluorescent. One cartridge helps to print approximately 12-13 average or 105-110 small objects. The Cube uses ABS and PLA plastic. ABS features the high durability and flexibility, its colors doesn’t fade for a long time. Objects made of ABS could be painted with acrylic paints. PLA is more rough, but less solid material, which hardens quickly. The printer defines, which material to use, and automatically changes settings. This entry was posted on Saturday, November 9th, 2013 at 9:02 am	and is filed under 3D, printer. "HP To Provide Mobile Printing To Millions Of Users"
"Lexmark MX310dn: Affordable And Quick MFP"